Elev start from the junction with the Highline Trail: 6656 to 4276 is used to access the "Loop" TH shuttle/parking lot via the Granite Park Chalet junction. It is a big u-turn that takes you all the way back down to the Going to the Sun Road (GTTSR). There is about a 2300 foot elevation drop from the junction but it's not bad. It is also a horse trail used to supply the Chalet. This trail used to be covered in forests... well it still is except the leafs and needles are missing from the trees as the area was burned over by the Trapper Creek Fire of 2003. There is very little shade. However, the silver lining is that your views are opened up quite nicely; especially of the awesome Heaven's Peak. 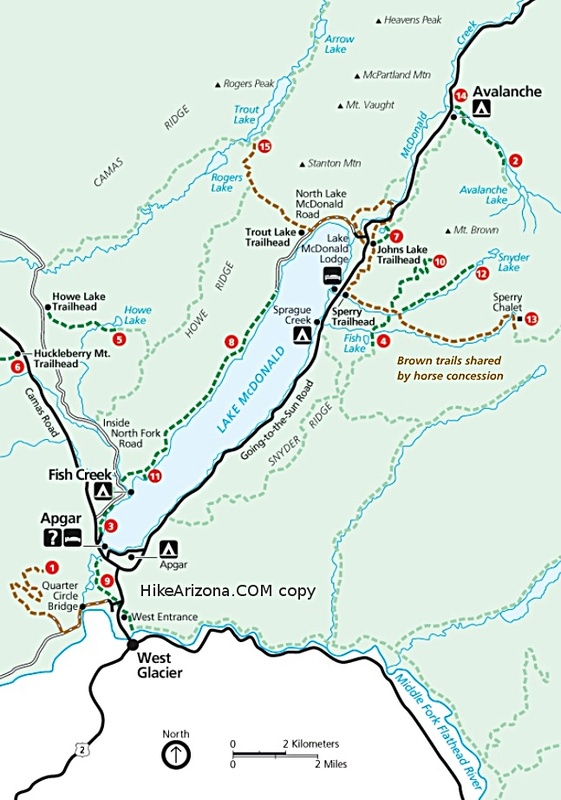 Since most hikers will be taking the Loop Trail as an extension of the Highline Trail back to The Loop TH, I will describe this hike that way. From the Granite Park Chalet Junction, you head west down the hill. 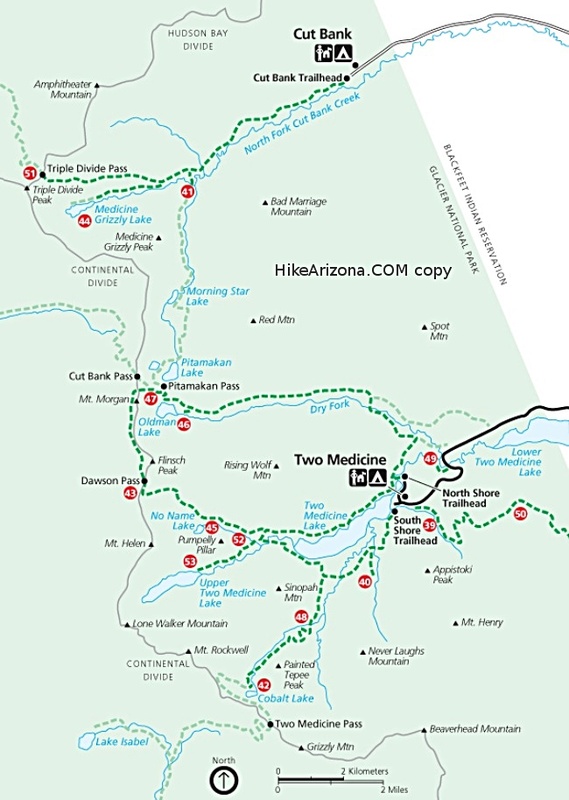 But before you get completely down that first hill, take the opportunity to look back and up at the Highline Trail and mountains above and to the south. You can see the notch that is the overlook area for Grinnell Glacier. The hill will take you down into a somewhat forested area where it levels off a bit. It is really quite lovely up here and you get great views of Heaven's Peak and the Livingston Range that stretches to the north. Before you know it, you've already dropped 500 feet in a mile or so. Now you will be leaving the forested area and entering the burn section. Again your views are expanded and include more of the MacDonald Valley and glimpses of Bird Woman Falls. You now will start heading south where you get views of the mountains to the west of the Logan Pass area. The trail is flanked by greenery on both sides including lots of Cow's Parsnip. After about a mile and 1/2 you'll start to lose site of the a good part of the Garden Wall to the east as you will be switching back to the north and slightly west. But before you do, you will see where the burned area with lots of dead trees comes to a stop. At about the 1.8 mile mark, look far down in front of you and you will see the bridge that you will be crossing to get to the TH. It is as far away as it looks since you still have another 2.2 miles to go. There now seems to be more and a variety of wildflowers along the sides of the trail; probably due to the sun exposure. 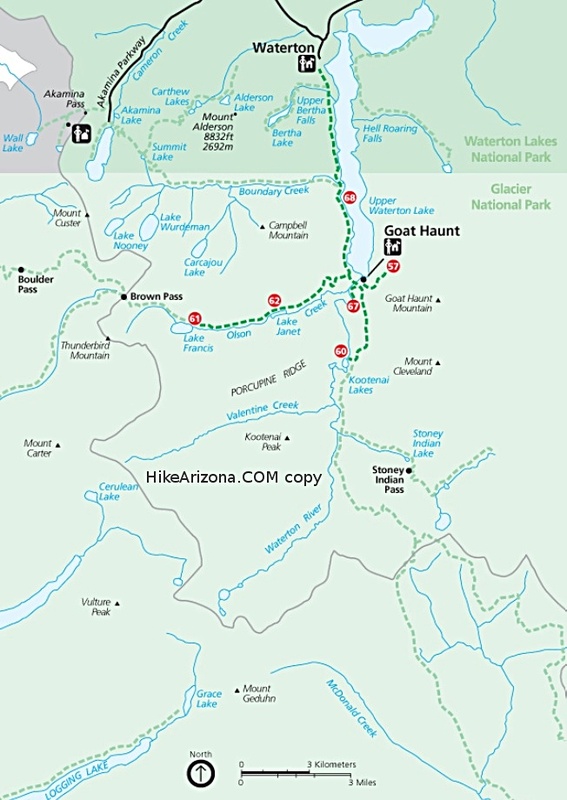 At about the 2.5 mile you start getting deeper into the burnt forest area that rises above the greenery at its feet and in about another 1/4 mile you will switch back to the north. From here you will meander up and down ever so slightly as you make your way through the forest looking for wildlife and spotting wildflowers along with running water here and there. 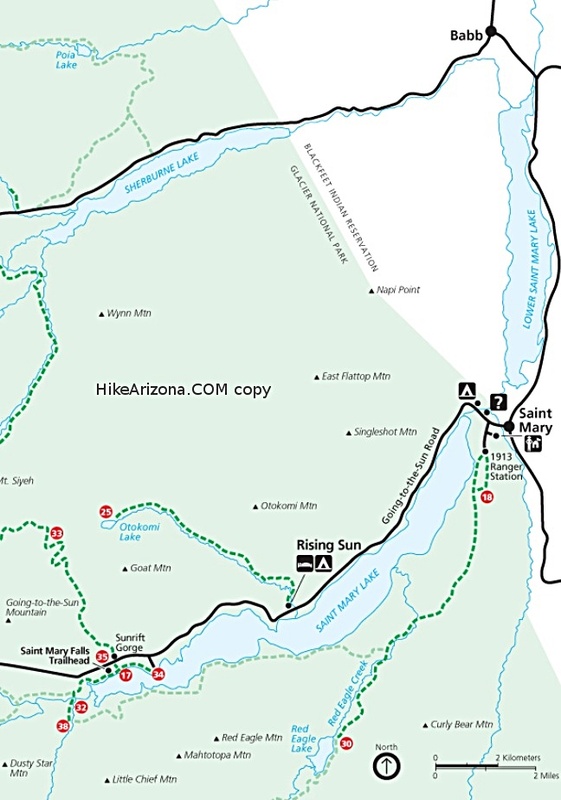 You will reach the lower Granite Park Trail junction at the 3.4 mile mark. 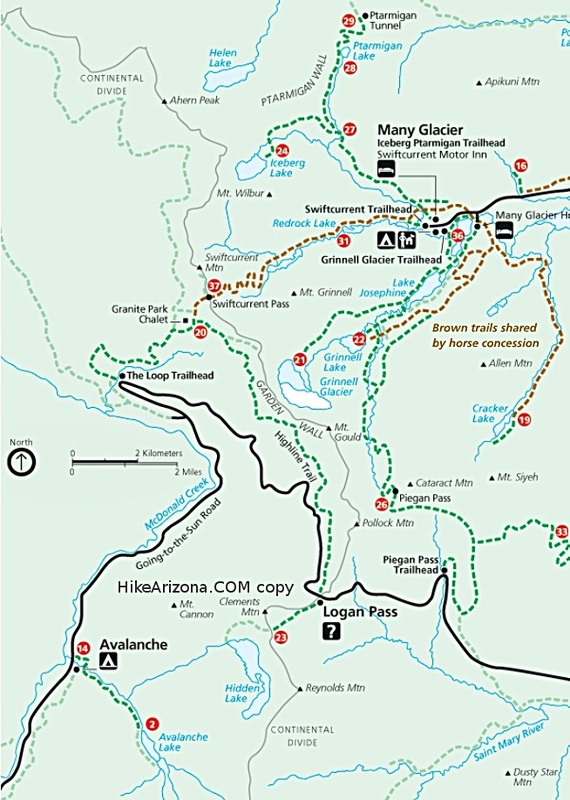 From there you will take the left trail (south) that says Sun Road to the Loop Trailhead. You are about 11.2 miles from the Logan Pass TH. Once again you will be hiking some gradual ups and downs but nothing significant. Before you know it, you come around a little curve, there's a bridge over a nice waterfall and you are at the Going-to-the-Sun-Road. If you are planning to use the shuttle, be mindful that the shuttles coming through may be full or can only take so many passengers. There is a restroom at the TH and concessions and a restroom at the Chalet.